Fourth-generation Californian, with thousands of stories from travels in 36 countries and hundreds of lessons learned from living, working and successfully navigating Greek bureaucracy for 16 years as an unmarried non-EU citizen. Newspapers and the wider public call me an American in Athens, which was the name of my original blog. 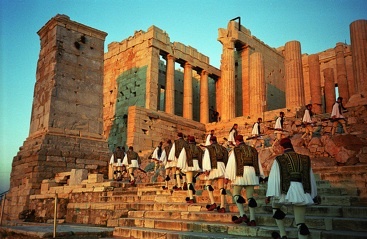 I first came here as a solo nomad when Greece still used drachmas and natives were hospitable to foreigners. It was winter, so I saw no islands or beaches, nor had I fallen in love with a Greek, run away from adulthood, bought a house or any of the other clichés. At Syntagma Square on Sunday, I heard the national anthem for the first time and didn’t understand a word, but something spoke to my soul. On that day, I made a vow. Four months later, I was back in Greece with nowhere to live, no job, no permit, no connections, no family or boyfriend to help, no Greek language skills, no funding or inheritance, no rent-free or mortgage-free property, and no parents or safety net back home. Yes, that’s right. I gave up a perfectly good life and salary to come live in poverty, continue a career and build a new life on my own from nothing because I loved Greece. In this post-9/11 world I’ve been forced to admit I’m American by nationality, though I’m more a world citizen with a U.N. family of friends that bring liveliness, culture and color to what I call my life. I have worked as a journalist and editor since 1996, and my reportage has appeared in the San Jose Mercury News, Kathimerini (Greek edition), Wall Street Journal, AOL News, United Press International (UPI), Editor & Publisher and The Guardian. This website has been featured by Frommer’s, the NY Times, CNN, Bloomberg, El País, Lonely Planet, Eleftheros Typos, Norway’s Official Site in Greece (and here), Eurail, US News & World Report, Focus, The Street, SKY News, Die Welt, Yahoo Travel, Boutari Wines USA, French Embassy of Greece; and recommended by Embassy of Denmark in Athens, German Embassy of Greece, Department of Foreign Affairs in Ireland, Estonian Ministry of Foreign Affairs, Department of Foreign Affairs in Norway, MSN Travel, Arbetsförmedling (Employment) in Sweden, Couchsurfing, Rick Steves, Hygeia and Mitera Hospitals, Athens University of Economics and Business, AIT and NY Times’ Frugal Traveler. It is also through this website and the livingingreece Twitter feed that I publish exclusives or break news in English several days or hours before mainstream media pick up the same story. Based on my writing credentials and expertise on Greece, I was selected to write travel guide “Greece: Instructions for Use” and will follow up with a living/working guide on Greece in 2013. — Interviewing friends, readers and willing acquaintances regarding their experience with Greek military duty, university studies, jobs and salaries, living abroad as Greeks and repatriating. My experiences in Greece are influenced by the fact I am human. In this case: An independent, unmarried, career-minded non-EU citizen of no Greek origin, living and working in Greece and four other EU countries. I do not call myself an expat, I do not have dual citizenship with the EU, and I am not a frequent visitor, trailing spouse or independently wealthy. I pay my own way through life and do not have family to support me or the luxury to leave this country whenever I wish. It’s not just research, it’s my life. To be clear, I am a lifelong student on this journey and absolutely positively do not know everything about Greece. I have much to learn but in the meantime am willing to share what I know. This website was started to present a combination of practical information and real-life personal stories without influence from sponsorship and advertising to inform and entertain people of ALL nationalities living in Greece, Greeks abroad, Philhellenes and anyone interested in moving or traveling to Greece in the future. It was founded to compel official government, EU and consular websites to start disseminating more transparent and accurate information to the public, as many did not exist or were in Greek and outdated. I choose not to offer links to websites, forums, guides and articles that are outdated, unreliable or written by people who push an agenda or started a copycat. If you do not see something here that you’ve seen somewhere else, it’s for good reason. Newspapers and official websites leave out essential information and rarely reflect reality, which is the reason my articles are independently verified and combined with first-hand experience. All of my sources are attributed. Posts are always updated to reflect the most current information, not archived and forgotten. If the information on this site does not reflect your experience, please see my ‘Warning and Disclaimer‘ to explain why that may be. In remembering my experience as a newcomer 16 years ago, there were two Internet cafes in Athens, no informational websites and only one useful but brief book on living in Greece for non-EU citizens published locally in 1995, now out of print. I did a lot of research before moving here, but the practical information I needed on permits, jobs and other bureaucracy could not be found in any language. I tried asking Greeks, though I soon found (and they privately admit) that being Greek does not automatically make one knowledgeable about Greece or foreigners, even if you are married to one. Taking into account I know Greek with proficiency and the Internet has evolved, there is still a void of complete and up-to-date information published publicly by media, private or (often unhelpful) governmental agencies for Greeks and non-Greeks alike. I created this website to fill part of that void. Official websites appeared years after mine and are getting better, but they are often incorrect. Some now use copies of my articles for English versions without permission, payment or credit. I know this because I make a point to check. There has also been a noticeable shift in the accuracy of information being dispensed since starting this brand, which is due to plagiarism and re-educating the public through livingingreece.gr, @livingingreece and the media agencies I work for. Despite this, I continue my work because I believe it serves a greater good and fulfills my mission in giving power back to the people who need it most. Thank you for stopping by, whether it’s for the first time or as a friend or foe in my humble corner of the universe!